Welcome to the Surf City Ocean Pier! 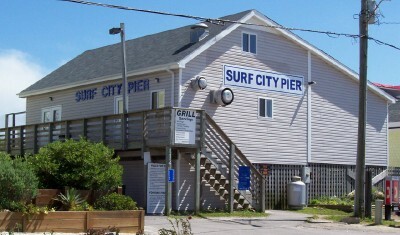 Topsail Island's first ocean pier, the Surf City Pier, was originally built in 1948. It has been owned and operated by the Lore family since 1973. Though it has weathered many storms (some better than others), Hurricane Fran destroyed it in 1996. It was totally rebuilt and reopened in August of 1997, looking much like it does today including a few additions. The Surf City Pier comes complete with large assortment of bait, fully stocked tackle shop, an eclectic collection of souvenirs fresh ground chuck burger's from the grill, and an outside covered dining area. Mid March - Dec. 1st ....24 hours a day 7 days a week. Please call the pier house in the off season for current hours or schedules.